Without doubt, this is one of the most bizarre films I’ve ever seen! Set in the near future in an alternate universe, it’s an existential allegory about the determination within every culture to pair people off. Whether heterosexual or homosexual, conforming means being part of a couple. When his wife leaves him for another man, David (Colin Farrell) has only 45 days to find another partner or face ‘Transformation’ into the animal of his choice. Most people want to be a dog, which is why there are so many of them. But David chooses to be re-embodied as a lobster. 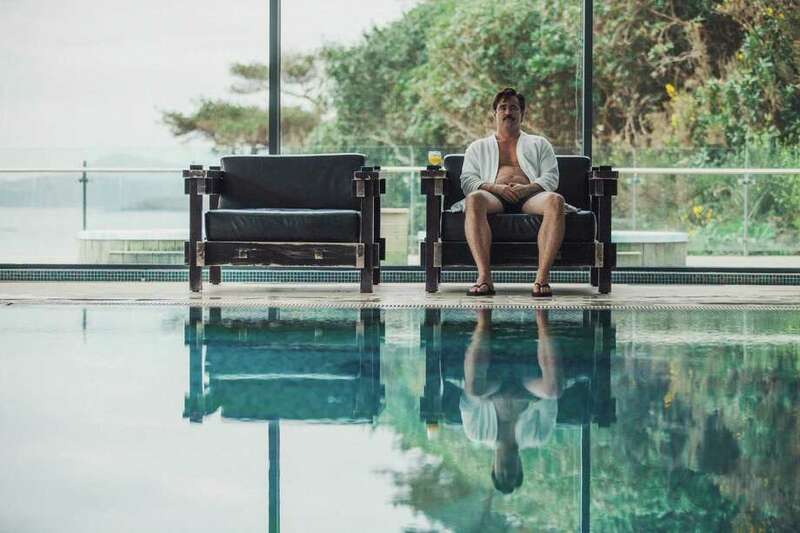 To facilitate finding a prospective mate, David checks into a spa-like Hotel, where the Manager (Olivia Coleman) sternly explains the regimented schedule required of him and other newcomers - there’s one who lisps (John C. Reilly), another who limps (Ben Whishaw), a woman prone to nosebleeds (Jessica Barden) and one who is heartless (Aggeliki Papoulia). While a maid facilitates sexual arousal, masturbation is forbidden. Not surprisingly, the guests grow increasingly desperate under the pressure to find a compatible companion. When a match is made, there’s a party and ‘honeymoon’ of sorts. If couples subsequently disagree, children are pressed upon them. “It usually helps,” declares the Manager. With his crustacean reincarnation looming, David flees into the forest, joining ‘The Loners,’ a resistance group. Their militant leader (Lea Seydoux) enforces her own set of Kafkaesque rules, forbidding any relationships. Then David meets his real soulmate (Rachel Weisz) - but is it too late? Greek writer/director Yorgos Lathimos first garnered recognition with his Oscar-nominated “Dogtooth” (2009) about three grown children raised in seclusion by their parents. His follow-up “Alps” (2012) explored the grieving process. Co-written with Efthimis Filippou, this is his first English-language film. Weird to the extreme, it’s, perhaps, the opposite of a melodrama. The acting is almost forcibly restrained as the grim, unconventional situation grows increasingly more primitive and punitive. On the Granger Movie Gauge of 1 to 10, “The Lobster” is a strange, surreal 7, an audacious, absurdist satire.